University of Houston Law Center Dean Leonard M. Baynes, left, Randall M. Ebner, Vice President and General Counsel of Exxon Mobil Corp. and Associate Dean Greg Vetter, right. 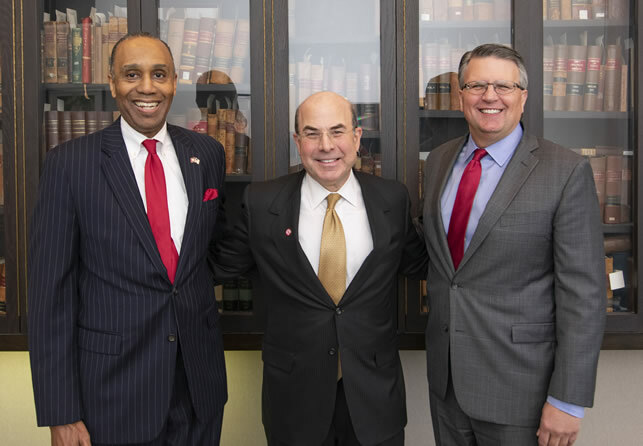 Feb. 7, 2019 - Randall M. Ebner, Vice President and General Counsel of Exxon Mobil Corp., encouraged students to be flexible and open to change while providing a roadmap to success at the University of Houston Law Center last week. Ebner served as the inaugural speaker of the 2019 Dean's Distinguished Speaker Series. "There is no one direct pathway in any career," Ebner said. "It's always important to be flexible. No matter what you do, have a passion. Don't think of being a lawyer as a job, but as your profession." When asked what inspired him to become an attorney, Ebner referenced his time as a member of his high school debate team that proved to be formative. "I always liked politics and to debate," Ebner said. "I always loved the whole process of standing up on my feet speaking to people and being an advocate. I still enjoy taking a position and being able to argue it." Ebner also talked to students about ExxonMobil's commitment to diversity, and how the corporation is working to meet growing energy demand, while also addressing the risks of climate change. Following a lunch with faculty from the Law Center's Environment, Energy and Natural Resources Center, Ebner also gave advice to pre-law students, including some enrolled in the Law Center's Pre-Law Pipeline Program. In the evening, Ebner participated in a fireside chat with Dean Leonard M. Baynes at the Petroleum Club of Houston. The event was titled, "The Role of General Counsel of a Multinational, Multicultural, Multidiscipline #2 Fortune 500 Company." Ebner joined the ExxonMobil law department after graduating from Tulane Law School in 1980. He was elected to his current position effective Nov. 1, 2016. During his career, he has held numerous positions in the law department, including litigation, transactional and management-related assignments. Most recently, he was assistant general counsel for compliance and corporate law. "The Law Center was delighted to host Randy Ebner and to kick off the Dean's Distinguished Speaker Series," Baynes said. "When I invited Randy to participate, I never expected that he would agree to spend all day with us, but was delighted that he did so. "The whole Law Center community benefitted from Randy's experience, expertise and wisdom on a host of matters. We were able to showcase the many different facets of the Law Center including current students, faculty, prelaw and UHLC Pipeline students, and alumni. It was a terrific day for us all." The event was co-sponsored by Houston Public Media and UH Energy.